We all know that chocolate makes everything better, especially dessert. We all know that chocolate makes everything better, especially dessert. But exactly how does it do this? Well, it turns out that adding chocolate or cocoa powder to a recipe can actually change the structure of your favorite dessert, not just the flavor. Have you ever wondered why that chocolate cake turned out just a little dry when you added extra cocoa powder? Or maybe the chocolate icing got thicker when you added the chocolate to it? Let’s explore! Cooking is art, but baking is chemistry. It takes a delicate balance of “load-bearing” ingredients (like flour and egg whites), and tenderizers (like sugar, oil, and egg yolks) to create soft cakes and decadent pastries, much like chemistry requires a delicate balance of chemicals. 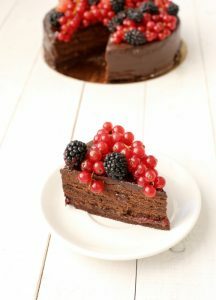 While chocolate does contain fat, it adds more structure, rather than tenderness, to your baked goods. Cakes and cookies that contain cocoa powder don’t require as much flour as those without. Mousse, frosting, glaze, and ganache are all essential components of desserts, but what is it that makes them so smooth and creamy? It’s the fat content, of course! The more fat that’s added to these things, the smoother they will be. Adding a chocolate that is high in fat will give your favorite dessert a smooth, creamy texture. The flour in your baked desserts is what soaks up all the moisture from the water, eggs, butter, milk, and other wet ingredients. Cocoa powder also absorbs moisture, but pound for pound, actually absorbs more moisture than the flour. If you’re adding cocoa to your recipe, make sure you decrease the amount of flour you use. Elevate your favorite desserts with Wockenfuss chocolate! Our breakup chocolate bars are separated into sections that are easy to break apart, so you get the perfect measurement every time! Pick some up in white chocolate, milk chocolate, or dark chocolate today! Live too far away to grab some from your local Wockenfuss store? Browse many of our chocolate and candy treats on our website and we’ll ship it to you. This entry was posted on Friday, October 20th, 2017 at 10:15 am. You can skip to the end and leave a response. Pinging is currently not allowed.